God knows, it’s not that I don’t love the kid. I have pledged my undying devotion to her here — she’s our firstborn, is kind to animals, has the soul of a poet, and is generally an all-around solid performer at the table. But Phoebe does not eat pasta. Phoebe, in fact, actively dislikes pasta. She hasn’t touched the stuff in five years. She wrinkles up her nose at the sight of it, says it’s slimy, boring, without flavor. I don’t know where she comes from, when she says things like this. The girl has not one but two Italian grandmothers and she doesn’t like pasta? As they say in the Old Country, WHAT THE? To each her own and te gustibus and etc. — we all have our food bugaboos, and there’s no accounting for them — but the upshot of Phoebe’s pasta aversion is that Jenny and I, two lifelong pasta lovers, have basically given it up in the interest of family dinner harmony. (Hence the minimal pasta entries on the ol’ DALS recipe index. Apologies!) But then, last Saturday morning, Phoebe woke up with some kind of virus. “Churny,” is how she described the feeling in her stomach. She didn’t have a bite of food all day, and spent much of the afternoon in bed. You know it’s for real when Phoebe says dinner doesn’t appeal to her. We used frozen corn and peas here, but you can use anything, really: broccoli would be good, as would spinach. You can also skip the pork at the beginning, but adding bacon in our house is like baiting a hook, and Abby can’t resist. So we went with the pork. Which doesn’t seem to gratuitous, as the chicken broth base makes this feel somewhat light, and a little bit healthy. Cook pasta according to package directions. Drain. While pasta is cooking, in a large skillet, over medium-low heat, cook bacon in olive oil with red pepper flakes, about 5 minutes. Add chicken broth and turn heat to medium. Simmer for 2 to 3 minutes, scraping any brown bits on bottom of pan as it cooks. Dump in peas, corn, scallions, salt and pepper. Stir and cook another 2 to 3 minutes. Add lemon and butter, and stir until it’s silky and emulsified. Dump cooked pasta into skillet and toss with tongs. Serve topped with plenty of Pecorino Romano. and i thought i was having a hard time because of a close friend who doesn’t eat onions! i hope your daughter is feeling better soon! I can’t imagine a world without pasta (and don’t want to! ), but my sister feels the same way as your daughter. And she’s a vegetarian! This sounds delicious, but I am eternally grateful to you (and your daughter) for the diversity of recipes on your website. My husband is diabetic, so we try to keep pasta dinners to minimum. 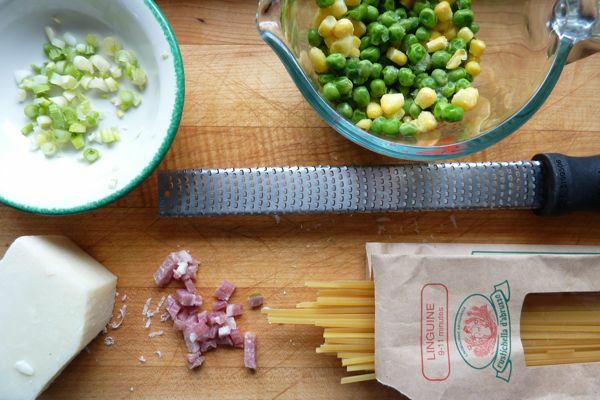 It is great to have plentiful suggestions for quick, easy, affordable, and delicious dinners that don’t center around pasta (which seem to be the go-to suggestion for many other family-friendly sites). You have a good solution there, one we employ in our house as well. As the kids get older and have more and more outside stuff happening, your pasta intake will probably increase, too. glad she liked it, and hope she’s feeling better. it seems like a delicious meal, and so, so simple. It looks great! We also have a pasta-aversion happening in our home, so much so that last night my daughter ate the filling out of the artisanal raviolis (one pear, goat cheese, arugula, the other porcini and truffle). A similar story lies behind how bread sticks — grissini, in Italian — were first invented in Piedmont. There, the child was the royal prince in Turin. His problem: an upset stomach. The solution, devised by the royal baker: crispy, toasty breadsticks. It worked. The prince was happy, the royal parents were happy–and so are we, being the beneficiaries every time we sit down in an Italian restaurant. Tell Phoebe she’s in good company! I am a newsletter subscriber. Do I win the Baked Better Bread Prize? When a recipe includes ham (even as a seasoning) can you please include it in the title? Originally thought this was a vegetarian dish. The distinction is important to me as a kosher-keeper and imagine others would appreciate it as well. Thanks. Made it tonight and really enjoyed! It was my first time making a ‘sauce’ with chicken broth like that…what a handy technique to know for the future! Hate to sound like I am jumping on some sort of band wagon but I have hated pasta for as long as I could remember (much to the chagrin of my large, Jewish-Italian family) and it turns out I had celiac’s (diagnosed when I was 10 and I am 40 now so I had it waaaaaay before it was cool….). As a child I couldn’t properly explain why but something inside me knew it wasn’t good for me and just I told my mom it tasted slimy and icky. Just a thought. Please note that I just discovered your blog so I don’t know how old she is or if you have considered this.